Bearing the name of its Sicilian founder, Antonio Monteleone, the hotel is one of only three designated Literary Landmark hotels in the United States. Though much has changed since 1886, it continues to be owned and run by the same family. The hotel features in Ernest Hemingway’s Night Before Battle, and was also frequented by many of America’s most celebrated authors: William Faulkner, Truman Capote, Eudora Welty, and Tennessee Williams among them (the latter first visiting as a young boy). 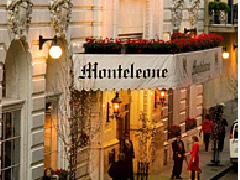 A sizeable hotel even by America standards, The Monteleone boasts some 570 guest rooms. It also features two restaurants, a fine bar, and a heated rooftop swimming pool.